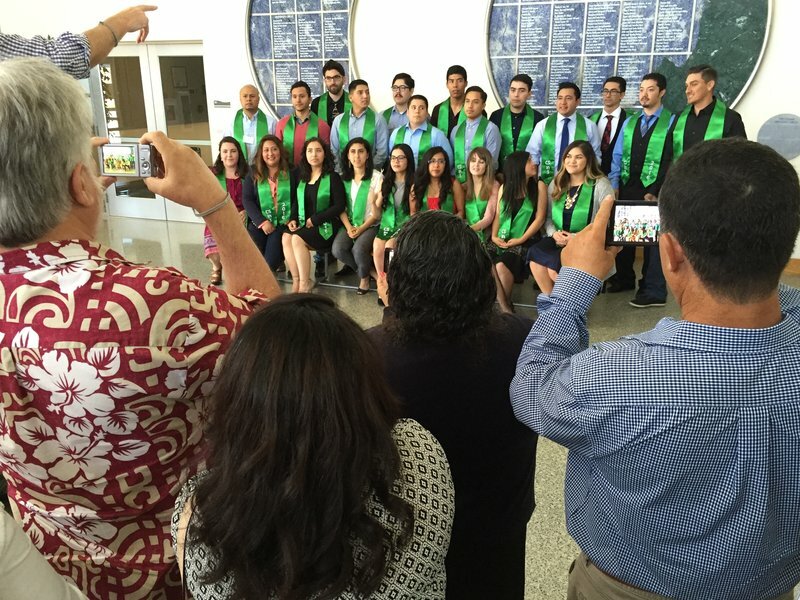 Upcoming graduates of the CSin3 program gather for a group photo as their family members snap pictures. An unlikely class of college graduates will walk the stage on Saturday. They’re the product of intensive three-year bachelor’s degree program in computer science called CSin3. We first told you about it when it launched three years ago. This joint venture (formerly called CSIT-in-3), between Hartnell College and Cal State Monterey Bay, aims to train students from California’s agricultural Salinas Valley to compete for careers in nearby Silicon Valley. In a field dominated by white and Asian men, this first cohort of graduates defies the demographics. It’s more than 80 percent Latino and nearly 50 percent women. “The skeptics and the doubters should know this is a program that truly works,” says Teresa Matsui of the Matsui Foundation. She’s the daughter of Salinas Valley orchid farmer Andy Matsui, who had the initial idea for the program and then paid for it by giving every student a full-ride scholarship. The Matsuis wanted to help families similar to those who helped their orchid business grow. 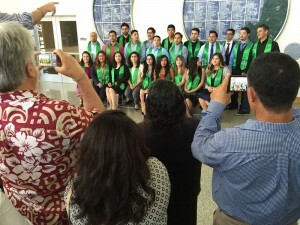 Many of the students in this cohort are the children of farm workers or immigrants themselves. The hope was to prepare them for jobs at Silicon Valley tech giants like Apple, Uber and Salesforce, and some have accepted jobs at those big-name companies. But since the program launched three years ago, a new opportunity has emerged to do high tech work here in the growing field of agricultural technology. Two students, Jose Diaz and Monse Hernandez, spent their summer interning at Cisco in Silicon Valley, but later took a second internship at local agriculture tech startup HeavyConnect. It creates software to help farmers streamline administrative tasks. Diaz and Hernandez built a program that unlocks a tractor’s ignition only after the driver completes a series of safety checks. “I’m not only doing this project to help the owners, the farmers themselves, but also figure out ways to help the employees because of all the hard work they go through, all the long hours in the sun,” Hernandez says. While she’s still weighing her post-graduation options, Diaz has accepted a job with HeavyConnect. HeavyConnect co-founder Patrick Zelaya has been so impressed with the CSin3 students that he held off filling full-time positions until graduation. He says it’s an added benefit that they bring both computer science skills and knowledge of the agriculture industry. “It was just luck that there’s this talent mill of students that are proving themselves to be technical rock stars by completing a four-year degree in three years in the same town that we’re starting this business,” Zelaya says. CSin3 co-director Joe Welch says some of the students came to the program from rural parts of the Salinas Valley, where they hadn’t been introduced to computer science in high school. “Absent the program they wouldn’t know how successful they could be if they just worked and worked and worked,” Welch says. In the Cal State system, only about 28 percent of students transferring from a community college finish on time. In the CSin3 program it’s 69 percent, and almost all the others will finish within the next year. Leticia Sanchez is one student who will be graduating in December. When she started the CSin3 program, she was still developing her English language skills; the majority of her schooling had been in Mexico. Now she’s also considering a career in agriculture technology. “I feel like if I stay in Salinas, I will be able to give back to my community,” she says. When Sanchez started the program she had a goal of earning enough so her mother could stop working in the fields. Now she sees that happening in the near future. “We’re seeing the embodiment of grit,” Welch says. And that grit is proving inspirational to others. Some younger family members of this year’s graduates are part of the next cohorts already underway.